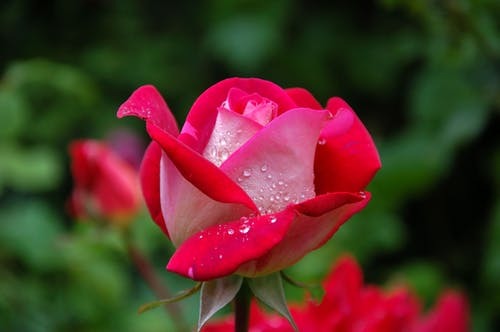 If you’re planning to buy roses for your wife or girlfriend on Valentine’s Day, good for you! I know she will enjoy them. However, as I explained recently to my good friend Ron, I’ve concluded that roses are a horrible depiction of true love. When Ron told me of his plans to give his girlfriend a dozen red roses, I suggested that he might want to reconsider. Ron thought I certainly must be teasing him once again. Despite his initial reservations, Ron is planning to give my idea a try this year. If his girlfriend sees the spiritual significance of the potted plant, it will become a lasting emblem of Ron’s never-ending love. If the idea bombs…well, perhaps the plant will soon end up in the dumpster, along with the wilted roses. But don’t forget this vital principle: In contrast with roses, the Bible says “love will last forever” (1 Corinthians 13:8). African violets may not arouse as many goose bumps, but I like the longevity. Posted in Inspiration, Relationships & Romance. Tagged love, romance, Valentine's Day.